There are three certainties you can count on in life: death, taxes, and Dynasty Warriors. The famous button-mashing hack-n-slasher is known less for its innovation between titles and more for releasing a new, slightly upgraded edition every handful of months. The latest iteration in the series is (deep breath) Dynasty Warriors 8: Xtreme Legends Complete Edition--and regardless if you've played any game in the series up to this point, it proves to be a shallow yet mindlessly fun action experience. Loosely based on the historical Chinese novel Romance of the Three Kingdoms, Dynasty Warriors follows the stories of the Wei, Wu, and Han clans as they fight for dominance of China’s numerous provinces. At least, that’s what Dynasty Warriors tries to do. Between the 80+ playable characters and the din of flashy, over-the-top power moves and wailing hair metal guitar riffs, it’s easy to get completely overwhelmed by all of the exposition and lose track of what’s going on. Still, Koei brings anime-inspired ludicrousness to a story that is anything but. In Dynasty Warriors, you’re tasked with picking from one of these family lines and working your way through feudal China’s history, all while killing off thousands upon thousands of soldiers. Combat is incredibly basic--sure, you can learn a few combos that alternate between light and heavy attacks, but mashing on a single button is an equally viable strategy. In fact, that’s really emblematic of the whole game: You unlock numerous skills, weapons, and characters while leveling up your general as you make your way through this saga, but you really don’t have to pay a lick of attention to any of that. As long as you watch your health bar and use your special attacks when you have them, you can shut your brain off and widow every single family in China. All of the options available to you present the illusion of depth, but there’s still something highly entertaining about watching your K.O. count climb into the quadruple digits. Some of you are probably thinking to yourself: "didn’t Dynasty Warriors 8 already come out a few months ago?" And you would be correct; as is typical with the Dynasty Warriors series, Koei releases a stand-alone expansion called Xtreme Legends a few months after every core game. These expansions add a few additional characters, some new modes, perhaps an extra storyline, but you still need the original game’s disc if you want to play any of the main campaign content. The Complete Edition is a decent package that brings the two together--you won’t need to swap discs or worry about missing any of the content, as it’s all here, ready to button-mash your way through. The two most obvious additions are the inclusion of Lu Bu’s own special campaign and a special challenge mode. The menacing figure from Dynasty Warriors 8 was relegated to a background role that got a few special missions if you found a way to unlock them. Now, he gets his own multi-level, several-hour-long story mode to plow your way through--though you’ll likely have no idea what’s going on unless you are well versed in Dynasty Warriors’ labyrinthine narrative. Challenge mode brings a couple unique time-attack activities to the mix, allowing you to submit scores to an online leaderboard, awarding you with new weapons upon success. Five additional characters join the roster (bumping up the total count to 82), new “What If?” scenarios have been added--and all of this is in addition to the numerous modes and unlockables already available in the original game. If charging through wave after wave of nameless bad guys is your thing, you will have no shortage of things to do in the aptly named Complete Edition. What you get out of this definitive version of Dynasty Warriors 8 will be based on how entrenched you are within the series’ roots. Newcomers and die-hard fans will get the most enjoyment from this edition--first time players will be going in completely fresh, able to explore its admittedly repetitive yet copious content without any prior experience, while super fans will know exactly what this new edition offers and will wring that content dry. Casual players who have already experienced Dynasty Warriors 8 will get the least out of it, as the additions and changes made are fairly minor and hard to notice unless you know the previous game inside and out, making double-dipping less enticing. Still, the move to next-gen brings with it some welcome changes in the graphics department. The good news is that this is the best Dynasty Warriors has ever looked. Save for a couple weird visual bugs, the whole experience just feels tighter than before. 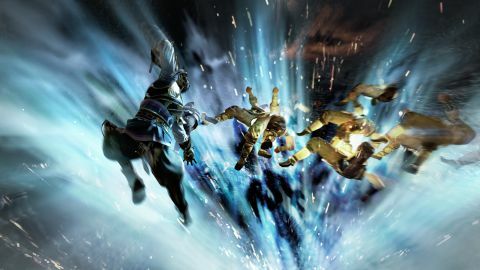 The much maligned frame rate choppiness from the Xbox 360 version is gone, making the Complete Edition on PS4 a much smoother experience than its last-gen counterparts. That said, it’s still very much a last-gen game, with an ever-present fog that permeates the distance surrounding your warrior, and textures that look like they’ve been ripped from a PS3 launch title. Even if the graphics aren’t exactly taxing the hardware, at least it can display hundreds of soldiers at a time without turning into a slideshow. If Dynasty Warriors 8 is the video game equivalent of a fast-food cheeseburger, then the Xtreme Legends Complete Edition is like an up-sized value meal. It’s the same game it’s been for the last decade or so, but now there’s more of it in a slightly prettier package. Dynasty Warriors may not be filling in the same way other games can be, but sometimes it’s OK to gorge on some empty calories every once in a while. Description Dynasty Warriors 8 and Dynasty Warriors Xtreme Legends combined into one title.